From Super Simple to Classic Simple to the All-Inclusive Deluxe No-Brainer Package, we've got a Vow Renewal Package for you! ***Note: A 4.167% Hawaii sales tax will be added to your total amount. Also, there is an additional $300 fee for vow renewals taking place on a holiday or on Valentine's Day, and a $150 fee will be assessed from February 10th-13th, and February 15th-17th (due to increased flower cost during this time). Please click HERE for special pricing for weddings taking place during the week of and two days after the World Triathlon Competition, October 7-14, 2019. Here on the Big Island, and it's just the two of you, and would like something in the next 72 hours? 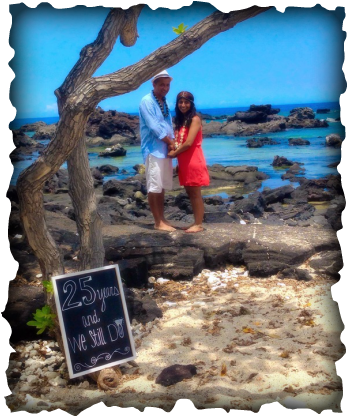 Otherwise, please scroll down for our Simple Kona Beach Vow Renewal Packages. This super simple package still contains the essentials and the care, but allows for you to add upgrades and options as you desire (or not). 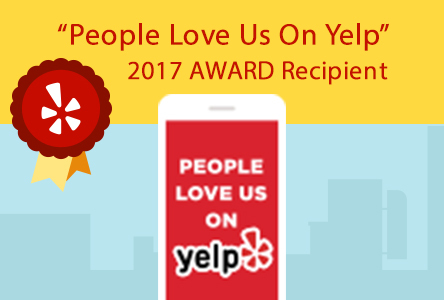 *Groups of up to 10 can be accommodated, but note that a $50 surcharge will apply to groups with more than six guests, with a maximum of 10 guests total for this super-simple package. **Note: The base rate of $525 applies is the "just the two of you" rate. The $575 amount is the base with guests, up to six, present. A 4.167% Hawaii sales tax will be added to your total amount. Also, there is an additional fee for vow renewals taking place on a holiday or other special weeks or days* (*see top of page for details). 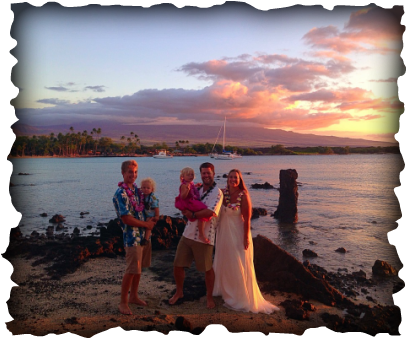 This Classic Simple Kona Beach Vow Renewal is both for elopements or smaller parties wanting our most popular upgrades included in their package, or for larger parties with up to 14 guests** (who also get more flare!). *More than 14 guests (16 people total) can be accommodated, but a custom quote will be issued. **Note: $795 is the base rate for elopements (i.e. just the bride and groom), and the $850 rate is for parties with guests up to 14. A 4.167% Hawaii sales tax will be added to your total amount. Also, there is an additional fee for vow renewals taking place on a holiday or other special weeks or days* (*see top of page for details). As always, you may add any upgrades and options as you desire (or not). 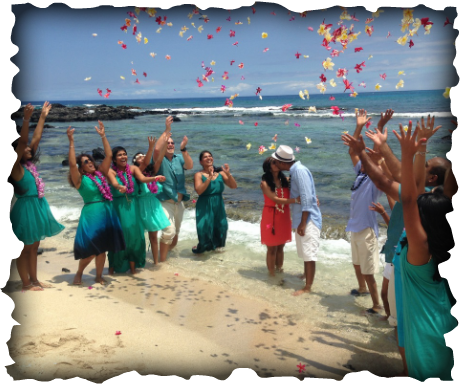 Whether it's just an intimate affair or whether you have 15 people coming to wish you well, the No-Brainer All-Inclusive Deluxe Simple Kona Beach Vow Renewal Package takes all of the deciding out of it for you, and gives you everything you'd want in a beautiful, yet simple beach wedding. *More than 14 guests can be accommodated, but a custom quote will be issued. **Note: A 4.167% Hawaii sales tax will be added to your total amount. Also, there is an additional fee for vow renewals taking place on a holiday, or other special weeks or days* (*see top of page for details). ﻿***The photos taken on your cell phone or camera that are included in this package are taken by a member of our staff. Please note that, although good, our staff member is NOT a professional photographer, and these photos are meant to be a complement to the work of the professional photographer present!